More recent information may be available in Ascendo Support Notes on Evernote. - What can I do if Network Error appears when I try to install DataVault for BlackBerry 10? - How do I download and install DataVault for BlackBerry? - How do I download and install DataVault for Windows? - Can I try DataVault before deciding if I want to purchase it? - How long it the trial period? - My trial period expired before I finished testing. Can I extend the trial period? - What are the requirements to run Ascendo DataVault? - What should I do if I see the error message "No Applications were found for your device.?" - What should I do if I see the error message "There is an XML syntax error on line 1."? - What should I do if I see the error message "907. Invalid COD."? - Can I run DataVault on a Mac and will it sync with DataVault for BlackBerry? - How can I copy information from DataVault for BlackBerry to DataVault for iPhone, iPad or iPod Touch? - Is there a version of DataVault for iPhone, iPad & iPod Touch? - Can I use Ascendo DataVault on multiple devices? - When I try to purchase Ascendo DataVault, I am being asked for my PIN. What is a PIN and how can I find it? - How do I upgrade and how much does it cost? - What are Registration Keys? - When I enter my registration key, DataVault displays a "Wrong Code" message. - I purchased DataVault in BlackBerry App World. Where can I find the registration key? - I bought DataVault in BlackBerry App World. How do I install DataVault on a new handset? - I purchased DataVault from Ascendo. If I change devices, do I have to pay for a new registration key? - I need a new registration key but I can't get one from an Ascendo sales partner. What are my options? - When I bought DataVault, I entered the wrong PIN and the registration key does not work. What should I do? - In some cases I cannot install a new version without deleting the older one from my device. How do I uninstall an application from my BlackBerry? - I am having problems synchronizing Ascendo DataVault for BlackBerry with the Ascendo DataVault Desktop. What could be the problem? - I installed version 6 of the BlackBerry Desktop Manager and I am having problems with synchronization. What options do I have? - I am trying to synchronize DataVault using the BlackBerry Desktop Manager on a Windows Vista machine. When I click on the following menu options: Synchronize > Configuration > Configure Add-Ins there are no check boxes to activate the applications in the list. Is there a work-around? - What should I do if I see the error message "net.rim.device.api.crypto.CryptoIOException" when trying to set up the master password on my BlackBerry? - What should I do if I see the message "Passwords on BlackBerry and PC do not match!" even though I think I am using the same password? - Why did Ascendo choose Advanced Encryption Standard (AES) over other encryption methods? - Why could it be beneficial to encrypt an email message with Ascendo DataVault? - When I use BlueTooth to synchronize DataVault or to beam an item to another DataVault user, is the information protected from other BlueTooth users? - If my BlackBerry is stolen, could somebody access the information I store in DataVault? - I downloaded the latest version of the user guide but a previous version is opened when I click on Ascendo DataVault Desktop > Help > User Guide. What should I do? Question: What can I do if Network Error appears when I try to install DataVault for BlackBerry 10? Answer: BlackBerry has confirmed that certain BlackBerry 10 devices cannot access purchase histories. This may result in a Network Error message when tying to upgrade apps on your device. Open a desktop browser and go to App World. Go to the DataVault description page in App World. Login to App World with the same BlackBerry ID you used to purchase DataVault. Click on the purchase or download button. You should see... "A message has been sent to your smartphone to purchase this item. To complete the purchase, check your BlackBerry 10 smartphone now." Start your BlackBerry, wait a few minutes, then follow the instructions in the message to upgrade DataVault. BlackBerry does not give developers access to the App World billing system. If you are still having problems, please contact App World support. Answer: There are two ways to download and install DataVault for BlackBerry, over-the-air (OTA) or by using the BlackBerry Desktop Manager. To download and install DataVault for BlackBerry over-the-air (OTA), follow these steps. For Versions 4.7.1, type http://tinyurl.com/n7azbm and click on the Return Key. Then follow the prompts to download, install and run the "DataVault Loader". This utility will detect the version of your BlackBerry OS and load the best version of Ascendo DataVault for your handset. If the DataVault Loader does not appear after installation, close the BlackBerry Browser and/or restart the DataVault Loader from the BlackBerry home screen or Download directory. For Version 3.55 (all models), type http://tinyurl.com/yjj494 then click on the Return Key and follow the prompts to download, install and run DataVault. If you have used these URLs to install previous versions, you should clear the browser cache and refresh the page to make sure you are downloading the most recent version. To download and install DataVault for BlackBerry using the BlackBerry Desktop Manager, follow these steps. Download the Ascendo DataVault ZIP file using a Desktop Browser such as Firefox or Internet Explorer. - For Version 3.55, click here. Extract the files in the Ascendo DataVault ZIP file using Windows 7, Vista, 7Zip, Winzip or a similar utility. Click on Application Loader, then click on Add Application. Browse to the BlackBerry directory at the location of the extracted DataVault ZIP file. Select the DataVault.ALX file and follow the prompts. To use DataVault on your desktop computer and synchronize with with DataVault for BlackBerry, you will need to download and install the Ascendo DataVault Desktop. Question: How do I download and install DataVault for Windows? Answer: For information on downloading and installing the latest version see the DataVault for Windows FAQ page. Question: Can I try DataVault before deciding if I want to purchase it? Answer: Yes, you can try DataVault for free for the duration of the trial period by selecting "Register Later" from the start screen menu. To continue using Ascendo DataVault after the trial period, you must purchase the product from Ascendo or one of our sales partners. Question: How long it the trial period? Answer: The trial period is currently 20 days plus 10 sessions. Question: What are the requirements to run Ascendo DataVault? Answer: Ascendo DataVault for BlackBerry require BlackBerry OS 4.0 or above and 300k of available disk space. If you would like to use DataVault on BlackBerry OS 3.9 and below, please write to info@ascendo-inc.com. Ascendo DataVault Desktop requires Microsoft Windows 2000, XP or Vista and 2.5Meg of free disk space. Question: What should I do if I see the error message "No additional applications designed for your device were found."? Question: What should I do if I see the error message "No Applications were found for your device."? 1. If you installed a previous version of DataVault, use the BlackBerry Desktop Manager to uninstall it. Then delete DataVault from the application list and and reinstall it. To do this, start the BlackBerry Desktop Manager on your PC, click on the Application Loader button, un-check the box next to Ascendo DataVault, click on the Next button and follow the prompts. Now return to the application list, highlight Ascendo DataVault and click on the Delete button. To reinstall DataVault, click on the Application Loader button, browse to the directory containing DataVault.alx, highlight it, click on the Next button and follow the prompts. 2. Download and install the latest version of the BlackBerry Desktop Manager and try to install the application again. 3. Download and install the application directly to your BlackBerry (OTA), as describe above. Question: What should I do if I see the error message "There is an XML syntax error on line 1."? Answer: This happens when you select a file with a .cod extension. To install Ascendo DataVault using the BlackBerry Desktop Manager, click on Application Loader, click on Add, select "All Files (*. *)" from the "Files of Type" drop-down list, then select "DataVault.alx". Question: What should I do if I see the error message "907. Invalid COD."? Answer: Usually this happens when you try to upgrade to a new version Over-the-Air (OTA) without uninstalling your old version. Please backup your data using Blackberry Desktop Manager, then uninstall the previous version, and install the latest version using instructions from this FAQ page. Answer: Yes. When the DataVault installer prompts you to "Choose an Install Location", click on the Browse button then select your USB drive. Once you have installed DataVault, select "Move data file..." from the File menu and select your USB drive. If you start DataVault without connecting your USB drive, DataVault will prompt you to enter a new master password twice and attempt to create a new database on the local drive. To continue using the database on your USB drive, click on the Cancel button, then connect the USB drive and restart DataVault. If you create a new master password by accident, quit DataVault and click on the Ok buttons when "Failed to create database..." is displayed, then connect your USB drive and restart DataVault. Question: Can I run DataVault on a Mac and will it sync with DataVault for BlackBerry? Answer: Yes. For more information about DataVault for Mac, including download & purchase links, please click here. For information about synchronizing DataVault for BlackBerry with DataVault for Mac, click here. Question: How can I copy information from DataVault for BlackBerry to DataVault for iPhone, iPad or iPod Touch? Answer: Make sure you are running the latest version of DataVault for Windows or DataVault for Mac. Then sync DataVault for BlackBerry with DataVault desktop. Once DataVault desktop is up to date, sync it with DataVault for iOS to copy your data to the new device. Question: Is there a version of DataVault for iPhone, iPad & iPod Touch? Answer: Yes. Ascendo DataVault for iPhone, iPad & iPod Touch is available from iTunes. Question: Can I use Ascendo DataVault on multiple devices? Answer: You but you must purchase one license for each BlackBerry device on which you wish to use Ascendo DataVault. Question: My trial period expired before I finished testing. Can I extend the trial period? Answer: When the trial period is finished, you will be prompted to purchase & register DataVault or to extend the trial for a certain number of user sessions. If the user sessions run out, you will need to purchase & register DataVault to continue using it or wait until a new version is available. Installing an new version will reset the trial period. If you don't want to wait for a new version, we suggest looking through the user guide to get an idea of the features and user interface. Ascendo DataVault comes with a 90-day money back guarantee. Question: When I try to purchase DataVault I am being asked for my PIN. What is a PIN & how can I find it? Answer: A PIN is a unique identifier for your BlackBerry handset containing 8 alphanumeric characters. When you start Ascendo DataVault on your BlackBerry, your PIN is displayed on the registration screen. Another way to obtain your PIN is to go to the BlackBerry home screen, click on the icon for Settings, then click on the icon for Options and select Status from the list. Your handset's PIN will be displayed near the bottom of the screen. Question: How do I upgrade and how much does it cost? If you purchased from our web site, please email info@ascendo-inc.com. If you purchased from Mobihand.com, go to the description page and click on the "Buy an Upgrade" link. If you bought from Handango.com, email info@ascendo-inc.com and ask for instructions. Answer: Download Protection is a service offered by Handango. You should refer to Handango.com for a current description. Download Protection is not required to download Ascendo DataVault from our web site, see above. Question: What are Registration Keys? Answer: Registration keys must be entered when prompted to continue using DataVault after the trial period is over. You must purchase DataVault to obtain a registration key. Some Ascendo Sales Partners refer to registration keys as activation codes but they are the same thing. Question: When I enter my registration key, DataVault displays a "Wrong Code" message. Answer: There could be several reasons for receiving a "Wrong Code" message when entering your registration key. 1) You left the PIN field blank when trying to register the desktop. 2) You are entering the wrong key for the version you installed. Registration keys for Ascendo DataVault are in the following format. Ascendo DataVault for BlackBerry Version 4.x: 5-digit code based on your handset's PIN. Ascendo DataVault Desktop Version 4.3 and above: BlackBerry PIN and same 5-digit code as on BlackBerry. Ascendo DataVault Desktop Version 4.0 to 4.2: 10 digit code. Ascendo DataVault for BlackBerry Version 3: 10 digit code. Ascendo DataVault Desktop Version 3: 10 digit code. For versions 4.0 to 4.2, the registration key for your BlackBerry is at the top of the email and the registration key for the Desktop is further down the page. 3) The PIN you submitted when purchasing Ascendo DataVault Version 4 is incorrect. Please check the PIN on the About screen of Ascendo DataVault for BlackBerry and verify that you are not mistaking "B" for "8", "A" for "4", etc. 4) You mistyped the registration key into Ascendo DataVault. Please verify that you haven't transposed numbers, left out a number, etc. Question: I am unable to enter my registration key using the BlackBerry Storm keyboard. What could be the problem? Answer: You may need to enable "compatibility mode" to enter the registration key, see steps below. If you purchased Ascendo DataVault from one of our Sales Partners, then you must contact them directly to retrieve your Registration Key. See below for links to initiate the process. If you purchased Ascendo DataVault from our web site, please forward your order confirmation containing the product name, version and order date, to info@ascendo-inc.com. Clearly state at the beginning of your email that you purchased Ascendo DataVault directly from our web site (http://www.ascendo-inc.com). If you purchased Ascendo DataVault from one of our Sales Partners, then you must contact them directly to obtain a Replacement Registration Key. See below for links to initiate the process. If you purchased Ascendo DataVault from our web site, please forward your order confirmation, or send an email containing the product name, version, order date and the email address you used to purchase the application to info@ascendo-inc.com. Clearly state at the beginning of your email that you purchased Ascendo DataVault directly from our web site (http://www.ascendo-inc.com). Question: I purchased DataVault from BlackBerry App World. How do I find the registration key? Answer: To find Registration Keys or "License Keys" for products purchased through BlackBerry App World, start BlackBerry App World on your device, log in, click on the "My World" tab to display installed applications. Then click on an application from the list to display the application details. The registration key should be displayed next to the "License:" label. Question: I purchased DataVault through BlackBerry App World then switched handsets. How do I install my applications on the new handset? Answer: The following instructions are copied from section called "Re-install items on a different device" in the BlackBerry App World user guide. Re-install items on a different device. To perform this task, you must install the BlackBerry App World™ storefront on your BlackBerry® device first. If you switch to a different device or delete all the data from your device, you can re-install all of the items that you bought from BlackBerry App World at no additional charge. On the My World screen, press the Menu key. Type the login information for your PayPal® account. Re-install each item individually. When an item is successfully re-installed, its status changes to Installed. Question: I purchased DataVault from Ascendo. If I change devices, do I have to pay for a new registration key? Answer: Ascendo replaces registration keys for up to two years after purchase. After two years, the fee to replace a registration key is $2.99. Question: I need a new registration key but I can't get one from an Ascendo sales partner. What are my options? Answer: If you are unable to obtain a replacement key from an Ascendo sales partner, Ascendo can provide a replacement key for $2.99 with proof of purchase. Question: When I purchased DataVault, I entered the wrong PIN number and the registration key I received does not work. What should I do? Answer: If you purchased DataVault from an Ascendo Sales Partner such as Mobihand or Handango, send the correct PIN to company's customer support and request a new registration key. Contact the sales partner that you bought the application from, submit the correct PIN and request a new registration key (see links in the question above). If you purchased the application from our web site, please forward the order confirmation including the date of purchase, to info@ascendo-inc.com. Question: I am having problems synchronizing Ascendo DataVault for BlackBerry with the Ascendo DataVault Desktop. What could be the problem? Answer: Ascendo DataVault uses the BlackBerry Desktop Manager to synchronize. There are issues with certain versions that may be addressed by one of the following workarounds. If you do not see Ascendo DataVault in the list of BlackBerry Desktop Manager Add-Ins then restart your PC and re-install the latest version of Ascendo DataVault Desktop without the BlackBerry Desktop Manager running in the background. You may have to repeat this more than once. Important: Please make sure that you are installing and running all programs: Blackberry Desktop Manager, Ascendo DataVault Desktop installer (DataVaultSetup.exe file), and Ascendo DataVault Desktop as Administrator of the computer. 2. Reboot your BlackBerry handset by removing the USB cable and battery for 3-5 seconds. Restart your PC. 3. 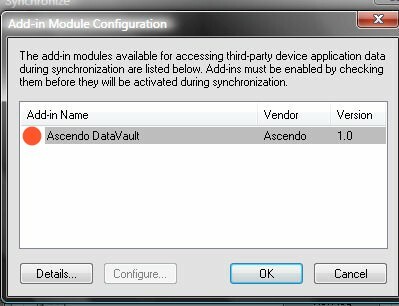 If you have tried the steps and synchronization doesn't work, please try to install the most recent version of Ascendo DataVault for BlackBerry and Ascendo DataVault Desktop. 4. If your BlackBerry device is connected to your company BES server then you may need to ask your administrator to enable "Allow desktop add-ins" IT policy in the BES settings. If you are still having problems, please send an email to wallet_support[AT]ascendo-inc.com including the your Version of Windows and Service Pack Number, version of Blackberry Desktop Manager and the version of Ascendo DataVault. Question: I installed Version 6 of the BlackBerry Desktop Manager and I am having problems with synchronization. What options do I have? Answer: In early releases of BlackBerry Desktop Manager Version 6, RIM appears to have removed an API used for synchronization by DataVault for Windows (v4.6.1 and below). We have released a new version of DataVault for Windows which fixes the issue for most users. Installation instructions & download link can be found here. If you install the latest production version of DataVault for Windows and you are still having problems, please try the steps below. Install the latest version of the BlackBerry Desktop Manager (v6.0.0.47) from the BlackBerry.com downloads page. If this link has been changed, go to BlackBerry.com > Apps & Software > BlackBerry Desktop Software. Then reinstall DataVault for Windows and try to sync. Install the latest version of DataVault for Windows. Verify that DataVault has been checked off in the Add-Ins section of Blackberry Desktop Manager. Close DataVault for BlackBerry and try to synchronize. Reboot your computer and do a hard reset of your BlackBerry by removing the battery for 5 seconds, then try to synchronize. If you are using Windows 7 or Vista, right-click on the Blackberry Desktop Manager icon and select Properties from drop-down menu. Then click on the compatibility tab and check-off "Run this program as an administrator. ", see link below for more information. If you are still having issues, follow the steps below to do a clean installation of the BlackBerry Desktop Manager. 1) Uninstall all versions of Blackberry Desktop Manager from your computer, restart your computer then install only version 6 of Blackberry Desktop, see links below. 3) Backup your DataVault information by selecting File > Backup from the main menu, uninstall DataVault for Windows choosing to "Erase all settings and data." when prompted. Then install the latest version of DataVault for Windows again, open it and restore your data using File > Restore from the main menu. 4) Check that DataVault checkbox is selected in Add-Ins section of Blackberry Desktop v6. 5) Close DataVault app on Blackberry and re-sync. If this doesn't work, then email DataVault Support with information about the versions of Windows OS, DataVault for Windows and DataVault for Blackberry. Synchronize DatatVault over Wi-fi or email. Instructions can be found in the user guide & troubleshooting FAQ. To receive real-time alerts for new releases, follow Ascendo on Twitter. Thank you for your comprehension. Question: I am trying to synchronize DataVault using the BlackBerry Desktop Manager on a Windows Vista machine. When I click on the following menu options: Synchronize > Configuration > Configure Add-Ins there are no check boxes to activate the applications in the list. Is there a work-around? Answer: This is a known issue with the BlackBerry Desktop Manager. The proposed work-around is to click in the window to the left of the application name where the check box normally appears (see red button below). The check box will not appear but the Add-in will be activated and the application should Synchronize correctly. We alerted BlackBerry Technical Support and we are awaiting a response. Question: Once I've entered information into the application, how can I back it up and restore it if there is a problem? Browse to the file that you made on your last Backup. Be aware that restoring will delete all current entries in the DataVault Desktop. Question: What should I do if I see the error message "net.rim.device.api.crypto.CryptoIOException" when trying to set up the master password on my BlackBerry? Answer: Set the password on your BlackBerry to the be same as the password on your DataVault desktop and try again. Question: What should I do if I see the message "Passwords on BlackBerry and PC do not match!" even though I think I am using the same password? Start DataVault on your BlackBerry. A dialog box will appear asking you to enter a password. Move to the Mask/Unmask check box and un-check it. In older versions of DataVault for BlackBerry, click on the track wheel or track ball to display the screen menu and select Unmask. Verify that the passwords on your BlackBerry and Desktop are the same or change them so they match. Restart DataVault on your BlackBerry and Desktop and try to Synchronize again. Answer: This is a well documented Windows issue that occurs in some circumstances when several application windows are open and one application is requesting user input. If you get this message, please check the task bar for an open dialogue window which is waiting for your input. Question: Why did Ascendo choose Advanced Encryption Standard (AES) over other encryption methods? Answer: The National Institute of Standards and Technology (NIST) chose the Rijndael algorithm as the new Advanced Encryption Standard (AES) over alternatives including Twofish (successor of Blowfish), Serpent, RC4 and MARS. The announcement concluded a multi-year effort working with government, industry and academia throughout the world. Proposed by two Belgian cryptographers, AES has emerged as the clear winner and has since been adopted as a worldwide standard. See links below for more information. AES Questions and Answers (NIST), "When considered together, Rijndael's combination of security, performance, efficiency, ease of implementation and flexibility makes it an appropriate selection for the AES." Advanced Encryption Standard (Wikipedia), "AES was announced by NIST... on November 26, 2001 after a 5-year standardization process in which fifteen competing designs were presented and evaluated..."
Is AES stronger than Blowfish?, "AES has higher design strength than Blowfish... It's also just much newer - it has the advantage of incorporating several more years of advances in the cryptographic art". The importance of IV's, "Rijndael was chosen to be the new AES because it was deemed to be more secure than Blowfish. Keep in mind that Blowfish never even made it into the AES competition." Question: Why could it be beneficial to encrypt an email message with Ascendo DataVault? Answer: Unprotected emails sent over the Internet follow a path that you have no control over. There have been many reports of emails being intercepted with Traffic Monitoring software that searches for keywords like "password" or "bank account". DataVault uses Advanced Encryption Standard (AES) to encrypt emails, offering the highest level of protection available for sensitive communications. Question: If my BlackBerry is stolen, could somebody access the information I store in DataVault? Answer: DataVault encrypts your data using Advanced Encryption Standard (AES), the official choice of a consortium including leaders in industry, academics and government. If a person stole your BlackBerry they would need to know your password to access the data. Resetting the password erases the data. An alternative method would consist of trying to crack the encryption key but the NIST estimates that a specialized machine would take approximately 149 thousand-billion (149 trillion) years to crack a 128-bit AES key, click here for more information. Question: When I use BlueTooth to synchronize DataVault or to beam an item to another DataVault user, is the information protected from other BlueTooth users? Answer: Yes, the data being transmitted by DataVault via BlueTooth is protected by Advanced Encryption Standard (AES). Question: I downloaded the latest version of the user guide but a previous version is opened when I click on Ascendo DataVault Desktop > Help > User Guide. What should I do? Answer: To resolve this, copy the latest version of the user guide to the directory in which you installed DataVault. The default directory is C:\Program Files\DataVault. Go to http://www.mobihand.com and click on the "Watchlists (+)" button on the product page. Go to http://www.handango.com and click on the "Add to Watchlist" link on the product page. In addition, you may want to sign up for our Newsletter, see Ascendo Home Page > Subscribe.